Since our commencement, our firm is engaged to introduce a premium quality array of ESD Safe Panda Shelf Bin. Designed to fit roll post shelving systems. 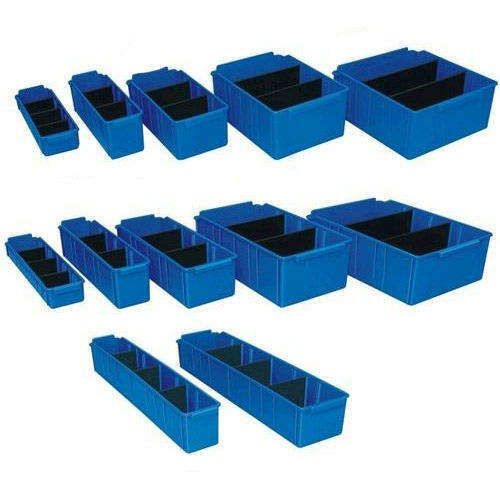 Twelve standard sizes to suit 300 mm, 400 mm & 600 mm deep shelving. Integral back stop for clear viewing of PANDA BIN contents. Dividers are notched to ensure positive location within the bins. PANDA BINS feature a small handle to allow maximum area of the front face for sticking identification labels. The PANDA BINS use a unique design for added strength. Art No. Outside Dimensions in mm Inside Dimensions in mm Art No.